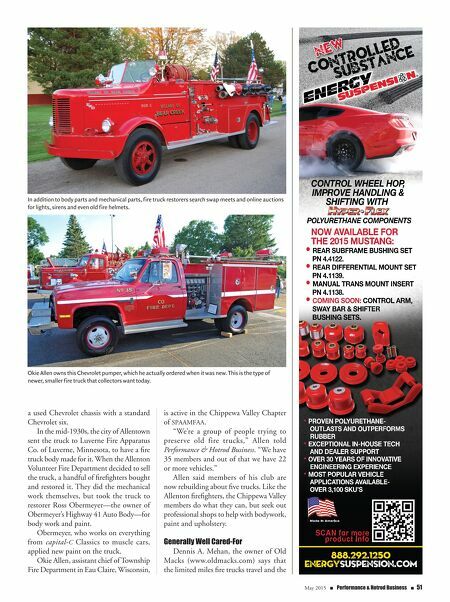 50 n Performance & Hotrod Business n May 2015 HOTROD toration shop can throw a new paint job on either type of fire engine, but special- ized trucks need more specialized shops to restore them. Special Engines What's special about old fire engines? "Seagrave and American LaFrance made their own fire engines into the 1940s and 1950s," pointed out Kenneth F. Soderbeck, who calls himself a fire truck restoration artist. Soderbeck owns Hand in Hand Restoration (redpaint@dmci.net) of Jackson, Michigan, which specializes in very old fire trucks. "Seagrave, in competition with American LaFrance, made two different big V-12-powered models," he said. "The larger one was their own design and the smaller one was based on the V-12 used in the Pierce-Arrow passenger cars made in Buffalo, New York. Smaller companies used available engines and chassis." Soderbeck said that the smaller trucks can be more easily restored. Small Fire Trucks The smaller trucks are those more likely to be brought to local restoration shops, rather than to shops like Soderbeck's. The Allenton, Wisconsin, Volunteer Fire Department owns such a truck built on Fire trucks like this 1920 American LaFrance Model 39 can be difficult to find parts for and restore. Having access to factory literature like this circa-1955 Mack product catalog can be a big help to the shop restoring a vintage fire truck. 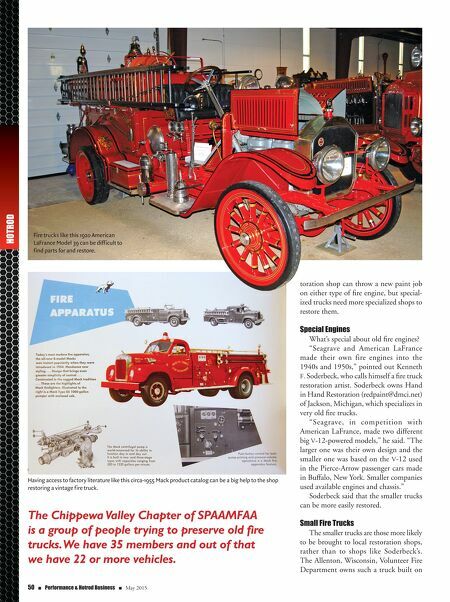 The Chippewa Valley Chapter of SPAAMFAA is a group of people trying to preserve old fire trucks. We have 35 members and out of that we have 22 or more vehicles.